The Elite Trio is a group of three of Bowser's minions that first appeared in Mario & Luigi: Bowser's Inside Story, who were promoted to elite troops in Mario & Luigi: Dream Team. It is made up of Private Goomp, Corporal Paraplonk and Sergeant Guy. They accompanied Bowser to Pi'illo Island, and continue to accompany him and Antasma throughout the story. They are fought in Dreamy Driftwood Shore after being found with Kamek, who was disguised as Princess Peach. All three members also appear in Mario & Luigi: Superstar Saga + Bowser's Minions and Mario & Luigi: Bowser's Inside Story + Bowser Jr.'s Journey as recruitable allies in the Minion Quest: The Search for Bowser and Bowser Jr.'s Journey modes respectively. The Elite Trio's primary gimmick is the need to defeat all three of them in a single attack. If one of them has not been defeated, they will revive the others with one HP. Corporal Paraplonk can also replenish his allies' HP with Mushrooms, in a way reminiscent of the Bowser Memory ML from Mario & Luigi: Bowser's Inside Story. Private Goomp gives this advice to Mario if one of them does fall in battle, but is then hit from behind by Sergeant Guy for telling too much. Private Goomp can attack by ordering the Sub-Goomba horde to pile up in a rectangular formation, which he sends to smash into Mario. By stomping on the pile, Mario can force the Sub-Goombas back to their commander, who promptly sends them back towards Mario. After several redirections, Goomp will eventually be hit by the pile; however, if Mario misses the pile with his jump, they will charge off-screen and return individually, forcing Mario to jump over any Sub-Goombas that are heading his way. Goomp can also summon Sub-Goombas from the background to replace any defeated members of his horde - if Mario manages to defeat enough Sub-Goombas on his turn, Goomp will skip his attack in favor of calling more reinforcements. Apart from his aforementioned Mushroom stash, Corporal Paraplonk can attack by having two Paratroopas place a block on either side of Mario before bouncing between them in his shell. To end the attack without being hit by the Corporal's shell, Mario must jump on Paraplonk mid-attack, rebounding him into Private Goomp and his Sub-Goomba horde. If deflected in this way, Paraplonk will damage Goomp, all Sub-Goombas horizontally adjacent to Goomp, and the entire first line of Sub-Goombas in the background. 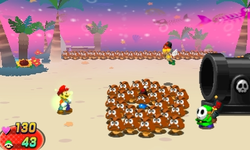 Sergeant Guy may attack by turning Private Goomp's Sub-Goomba horde into copies of himself, which attack Mario from all four sides. Each Shy Guy will either run past Mario harmlessly or run up to Mario and smash him with a hammer. Mario must turn to meet each attacker and counter them with a Hammer strike of his own; hitting the authentic Sergeant Guy (identifiable by a black flag with a red Bowser emblem on his back) will end the attack. The Sergeant can also attack by firing a Banzai Bill from his Sergeant Guy Cannon, but the attack can only be used after Guy spends a turn loading the cannon with a Banzai Bill; if Mario attacks the cannon before it can fire, the Banzai Bill will explode prematurely, causing massive damage to all enemies. If the cannon does fire the Banzai Bill, the player must repeatedly press to outrun it - doing so will cause the projectile to bounce off the ground and hit Sergeant Guy instead. The Elite Trio's final attack has Sergeant Guy and Corporal Paraplonk getting a huge Bob-omb, which sergeant Guy uses to chase Mario (for his part, Paraplonk hovers overhead to watch the chase). Private Goomp will realize this too late to get out of Guy's way, forcing him to flee with his Sub-Goomba horde. As Mario runs from Sergeant Guy, Goomp and his minions will charge forward in an attempt to escape the Bob-omb, which Mario must stomp on or dodge. If Mario gets hit by any of the Sub-Goombas or Goomp, he will trip and Sergeant Guy will throw the Bob-omb on him, causing massive damage to the plumber. If Mario successfully avoids being hit by any Goombas for the duration of the attack, the Bob-omb will explode in Sergeant Guy's hands, damaging him, Paraplonk, and any Goombas that failed to escape off-screen. After the trio's defeat, Kamek demotes them to janitors for losing, then teleports them out. Mario and Luigi briefly encounter the Elite Trio again when they are going after Bowser after defeating Antasma for the final time. This time, the three minions decide to roll giant Bob-ombs down the spiraling ramp to prevent the Bros. from getting up to Bowser. During the credits of the game, Private Goomp and Sergeant Guy end up rocking the Koopa Clown Car so much trying to collect coins that it falls into the ocean, prompting Paraplonk (with assistance from Kamek) to rescue them and Bowser. Later in the game, Elite Trio X can be fought in the Battle Ring. Each member's strength seems to match their rank, with Private Goomp being the weakest and Sergeant Guy being the strongest. Private Goomp drops an item (a Mushroom) inside a large Gift, a rare case of this happening. Private Goomp jumps up and down on his ally. Corporal Paraplonk lands next to his ally and shakes/tickles them. Sergeant Guy bops his ally with his wand. In Mario & Luigi: Superstar Saga + Bowser's Minions, the three eventual members wear their Elite Trio garb, despite not having been promoted yet. This page was last edited on March 30, 2019, at 14:10.